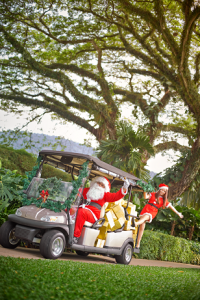 The festive celebration begins at Rasa Sayang with beautifully decorated Christmas trees in the lobby and restaurants from the first day of December. A 7-foot tall unique Christmas tree constructed from two types of popular Malaysian spices, Star Anise and cinnamon sticks fills the atmosphere with their wonderful aroma. The tree fittingly placed in front of Spice Market Café, the all-day dining restaurant at the resort. The peak of the celebrations start on Christmas Eve with an evening cocktail for all guests at the Banyan Tree Garden where carollers from The Seventh Day Adventist Church belt out popular Christmas carols in harmony. 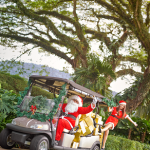 The Santa Claus and Santarina will also be seen around the resort on Christmas Eve and Christmas Day giving out candy canes to everyone they meet. On new year’s eve, Rasa Sayang gets ready to welcome 2019 the theme “The Great Gatsby” in colours of black and gold at the Raintree Garden. Guests, munching on snacks and with drinks in hand, will be serenaded with great music by Somebody Who, a local band in Penang. The countdown party ends at the stroke of midnight with black and gold balloons raining down in honour of a completed 2018 and a grand welcome for 2019. Golden Sands Resort welcomes the festive season with cheerful Christmas decorations in the lobby and restaurants from the first day of December. During this season, candies and balloons will be given to all children upon their arrival to the resort. On Christmas Eve and Christmas Day, carollers from The Seventh Day Adventist Church will perform some popular Christmas carols with the guests at the garden in front of Lobby Lounge. The Santa Claus and Santarina, donned in their bright red coats and hats will be making their appearances on both days, giving out candy canes to the gleeful little guests. The countdown party on new year’s eve at Golden Sands Resort will be held at the beachfront with an open bar serving snacks and all night entertainment by a live band. Later that night, the emcee will take the stage and encourage all in attendance to countdown together the final ten seconds before midnight. Then right at the stroke of midnight everyone in unison will bid farewell to 2018 and welcome a brand new year.